Form CINC-1-1.0 is a Connecticut Secretary of the State form also known as the "Interim Notice Of Change Of Officer/director". 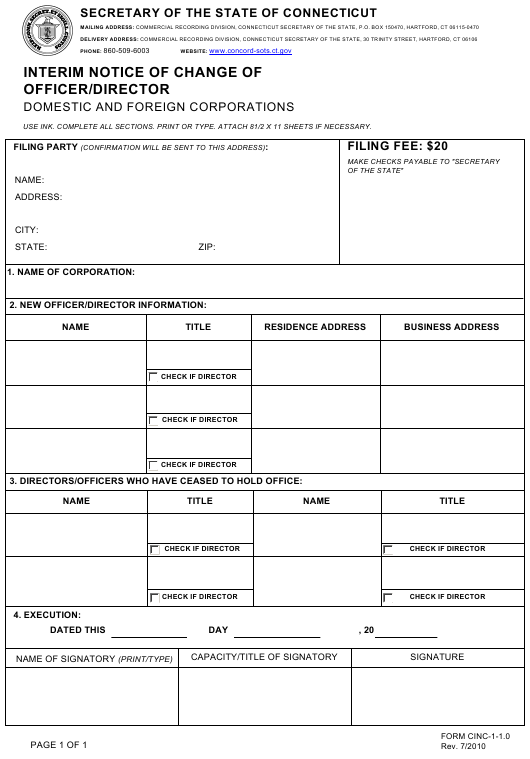 The latest edition of the form was released in July 1, 2010 and is available for digital filing. Download a fillable PDF version of the Form CINC-1-1.0 down below or find it on Connecticut Secretary of the State Forms website. USE INK. COMPLETE ALL SECTIONS. PRINT OR TYPE. ATTACH 81/2 X 11 SHEETS IF NECESSARY. provide the name under which it is currently authorized to transact business in Connecticut. a check following the statement "Check if Director" if applicable. penalties of false statement that the information provided in the document is true.